Jesus says, “I am the Good Shepherd, and I know mine and mine know me, just as the Father knows me and I know the Father; and I will lay down my life for the sheep.” He died on the cross so that we might be his. So are we really his? Do we really belong to God? No one can take us from him, but it is possible for us to refuse to follow. One of the greatest gifts we have received from God is our free will, but at the same time it is the gift that makes it possible for us to reject him. The purpose of our Christian faith is to guide us in the choices we make; to form our conscience, which is also a gift from God, so that we will be able to recognize the voice of the Good Shepherd and follow him to safety. He invites us to follow him; he doesn’t force us. When we continue to do things we know we shouldn’t do, it makes it more difficult to recognize his voice and follow him. The Good Shepherd wants all of us to be happy, even if things are very difficult. He promised he would help us if we would come to him. Why is it so difficult for us to come to him? Do we think he will expect too much from us? Do we think we are not good enough to expect anything from him? He loves us unconditionally and only wants what is good for us. 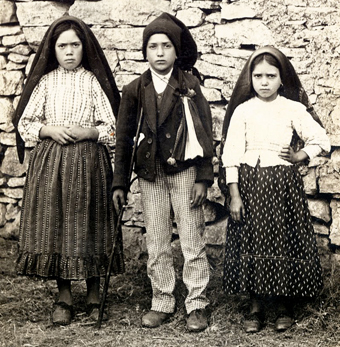 In Fatima, Portugal, in 1916, a year before the apparitions of the Mother of God, an angel appeared to three young shepherds as they tended their flock; Lucia was age ten, Francisco eight and Jacinta seven. He was preparing them for the apparitions they would receive from the Blessed Virgin Mary. This is the prayer he asked them to pray: “My God, I believe, I adore, I hope and I love You! I ask pardon of You for those who do not believe, do not adore, do not hope and do not love You.” This simple prayer reveals to us what is necessary in our relationship with God. What does it mean to believe in God? We all received the gift of faith in baptism, but to believe is a choice. What we believe right now is a consequence of choices we have made. God has revealed His plan for each of us through the Sacred Scriptures and through the teaching authority of the Church so that we might believe in Him and be saved. To believe in God is to believe in what He has revealed and to be faithful to what we believe. What does it mean to adore God? First of all we must have the wisdom to recognize who God is and who we are. In Psalm 111 it says: “The fear of the Lord is the beginning of Wisdom…” This is not a cowering fear, but an awesome fear. Fear of the Lord is a gift of the Holy Spirit that helps us to be docile to receive inspirations from God. God is eternal and Almighty and we are His lowly creatures, and yet He loves us so much that He created us in His very own image so that we might be called children of God. He loves us so much that His own Son died on the cross to save us from our sins. It is the desire of God that we worship and adore Him. That’s why we come to Mass every Sunday, but to adore God is more than just spending one hour a week at Church. To adore God is to honor Him for who He is and to desire to please Him; to spend time with Him in prayer every day. We should begin our day with Him, asking Him to help us in all we do. We should pray before every meal, every time we get in a car, every time we begin a new task no matter what it is. We should pray before going to bed. We should pray for our needs and the needs of others and praise God for all the good things He has done for us. What does it mean to hope in God? It means to have a trust in God that perseveres to the end, no matter how difficult the circumstances. It is a trust that places the Kingdom of God before everything else. It is this hope in God that enabled martyrs to die for their faith and allows us to experience peace and joy, even when undergoing trials. What does it mean to love God? “We must love the Lord Our God with all our mind, with all our strength and with all our heart.” This is not a suggestion as some people might think. God commands us to love Him because He created us for Himself and we will never discover true and lasting happiness unless it is in relationship with Him. He is the source of all love, and the more we love Him the more will be able to love others. The most important thing you can do for yourself and for the people you love is to keep the first commandment. My God I believe, I adore, I hope and I love you and I ask pardon for all those who do not believe, do not adore, do not hope and do not love you. In this prayer that the angel taught the three young shepherds, God is telling them, and us, that we must live the three theological virtues of faith, hope and charity and that we must adore God who loves us so that we can discover our purpose in life, and to be happy now and for all eternity. These three children took this prayer to heart and faithfully followed the Good Shepherd who led them safely to heaven. If we will pray this little prayer every day with the same fervor as the three little shepherds we will certainly recognize the voice of the Good Shepherd and allow him to guide us through all the difficulties of this life and to bring us safely home to the Father when we have reached the end of our pilgrimage. This was Deacon Tom’s homily for the 4th Sunday of Easter (B), preached at St. Matthew Catholic Church in San Antonio, Texas. We are in the middle of the Easter Season – the Catholic Church’s 50-day liturgical season. It’s a time to celebrate the Resurrection of Jesus Christ, the Son of God, and it’s my favorite season in the Church’s calendar year. The scripture readings proclaimed every day during Mass are about Jesus’ Resurrection, His apparitions before His ascension to Heaven, His Promises and the beginning of the early Church. It also reminds me of the Holy Land. When Tom and I first traveled to Jerusalem several years ago, we were searching to learn more about the land of the Bible, about the land where Jesus walked. While in Jerusalem, we were able to attend Mass in the Basilica of the Holy Sepulcher that is built over the Tomb of Christ, Calvary and the surrounding area. After Mass, we had the opportunity to enter a large marble edifice built over the ancient tomb of Jesus. 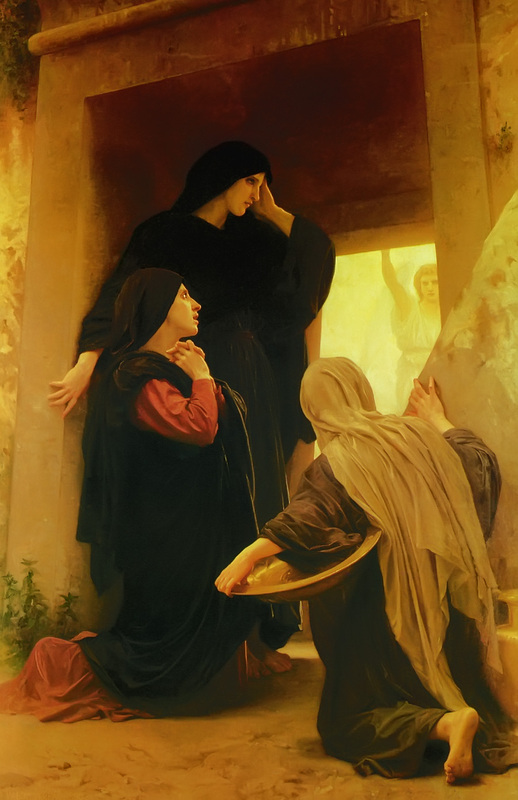 Upon entering, there is a small chamber called the Chamber of the Angel, where the Angel stood and addressed Mary Magdalene and the others, “He is not here, for he has been raised just as he said. Come and see the place where he lay” (Matthew 28:6). Then you must bow very low to enter a smaller area where five persons can fit in tightly. 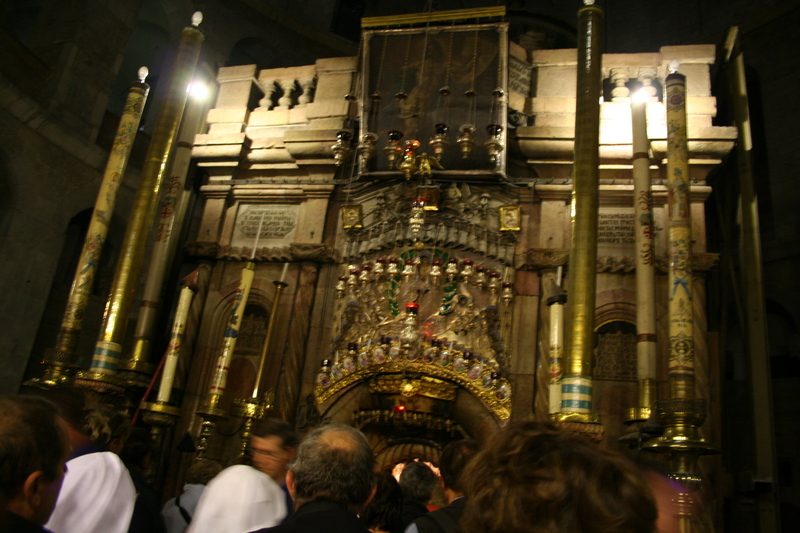 To your right, you see the place where the body of Jesus was placed, wrapped in linen cloth. Here is where Jesus was raised from the dead, where the Resurrection occurred! You can imagine the feelings we felt as we touched this place, and recalled the Gospel stories in our minds. We knelt and kissed where His body laid, we placed our arms on this stone slab and thanked God for this moment! We thanked God for allowing us to kiss His empty tomb. I remember thinking, “Lord, you know we are here!” It was as if time stood still for us both, recalling what occurred there 2,000 years ago! And what indeed occurred there affected us and millions of others. Even after visiting the Holy Land numerous times, leading pilgrims on pilgrimages; our time spent in the Basilica of the Holy Sepulcher is always a highlight, as it would be for any Christian! Our pilgrim groups have Mass in the Tomb, we read the Resurrection story from the Gospels, we pray, and we receive Eucharist in the Tomb. After leaving the Tomb, we are filled with great joy, with peace. Does it remain with us? Yes! If we continue to follow Him in our daily lives. When I am distraught, or experiencing a trial; I remember my time in the empty Tomb! Today, April 23rd, I will have major hip surgery. Before going under anesthesia, I will certainly call upon the Risen Lord and recall my time in His empty tomb and other sites in the Holy Land where He lived. Whenever you need to be reminded of His presence under dire circumstances, think about your favorite scripture story, or a spiritual experience that reminds you of His presence. Yesterday, my husband and I spent the day in the baby’s room. You see, we are expecting our first child; I’m 7 months pregnant. We were putting away gifts that were given to the baby at a baby shower I just had on Saturday. It finally dawned on us after looking over the baby’s room that it was no longer going to be just the two of us – but that another person was going to be a part of our life now. This little baby was going to rely on us to take care of her, feed her and love her. I started to think about the huge responsibility that was going to entail. 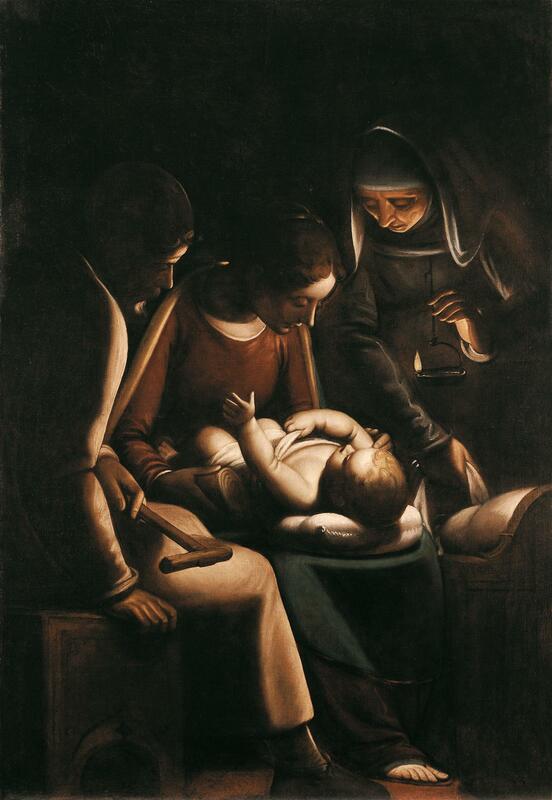 I was beginning to feel overwhelmed by it all when I began to think about the Holy Family. What was it like for Mary when she was preparing for Jesus? Did she feel like me? How was Joseph feeling about becoming a father soon? Did they have everything they needed to care for Jesus? I know that they were both people of great faith. I have faith too, but mine doesn’t compare to the faith they had. Even though I pray, I still think of how I will be as a mom. How we will be as parents to this precious baby girl? I’ve been asking Mary to help me throughout this pregnancy to be that loving mother to my daughter as she was to Jesus. I’ve been praying to Joseph, too, and asking him to help my husband be the father he is supposed to be for our daughter. Even though Joseph and Mary don’t speak to me personally and tell me how they felt or tell me that all will be OK, I do know that they put people in mine and my husband’s lives that will help us. In fact, those people are already helping us by providing us with not only items that will help us care for the baby but also with their love and support. I truly feel blessed that we are surrounded by the love of family and friends – on earth and in heaven. Do we have some sort of sick fascination with suffering and pain? I acknowledge how strange it must seem: Someone volunteers to wear a crown of thorns and hardly a loincloth, walk through the street followed by a shouting crowd of people, carrying a heavy piece of wood, perhaps hit with cords or strips of leather, and then put up high where everyone can see…all while onlookers weep or cringe. Add to that the ache of a hungry belly and less energy from fasting. Why do it all? Let me tell you a quick story to answer: When I first visited my husband’s hometown, we had been engaged for a few months. As a native Texan, this was my first time in California outside an airport. His mom picked us up and drove us to their home. She and Dan were talking up a storm, but I hardly said a word from the backseat. Because I was busy. Everything about this place, I wanted to take in. My eyes were like two sponges packed into my head, soaking in the visual information as we sped past buildings, intersections, highway signs, trees, bicyclers, and the Bay. We took the turn onto the street whose name I’d heard repeated so many times and had seen written on the corners of envelopes. Arriving to their home, I settled into my little guest room. “This used to be Daniel’s room,” his mom told me. I liked that. As everyone was getting settled downstairs, I stayed in that room and sat on the bed studying the texture of the walls. Out my little window, a breeze caused the tree leaves to sway. It may seem silly, but watching those leaves dance in the wind is probably one of my favorite memories from the entire trip – especially silly, maybe, considering the fact that we later spent several days in the mountains near a beautiful lake for a big wedding shower in our honor. But that’s what happens when you love someone; you want to know everything about them. You want to visit their hometown, eat their favorite foods, see their baby pictures, hear them recall their happy and somber memories. You want to experience their experiences as much as you can. …there was just this one thing: He is God. He can’t sin. Saint Paul reminded the early Hebrew Christian community that “since God’s children share in blood and flesh, [Jesus] likewise shared in them, that through death he might destroy the one who has the power of death, that is, the devil, and free those who through fear of death had been subject to slavery all their life” (Hebrews 2:14-15). In other words, God loves us so much that he wants to free us from sin and its terrible effects; he ‘paid’ the price of sin so that we wouldn’t have to. “For this reason he had to be made like them, fully human in every way, in order that he might become a merciful and faithful high priest in service to God, and that he might make atonement for the sins of the people” (Heb 2:17). Let’s remember that as we commemorate the Lord’s Passion today. Full photo of the Shroud of Turin. The Shroud of Turin is widely believed to be the actual cloth that covered the body of Jesus Christ in the tomb. It is mysteriously imprinted with the front and back image of the body of a man who has been cruelly beaten and crucified, and contains bloodstains corresponding to the wounds of scourging and crucifixion. Facial image of the man on the Shroud. I first became aware of the Shroud in 1975 when I saw a picture of the Shroud’s facial image included in a newspaper article about the famous relic. From that moment on, I have studied the Shroud and have become a staunch advocate for the acceptance of its authenticity as the true burial cloth of Our Lord. Because of my devotion to the Shroud, I have given presentations on it throughout the country. Early in 1978 it was announced that the Shroud was to be placed on public display in Turin, Italy for the first time in nearly 45 years. My wife, a life-long Catholic, strongly encouraged me to make the trip to Italy to see the Shroud first-hand. I believe that she sensed that this experience would become a life-changing event for me, which it did. I was not a Catholic at the time, but that would soon change. When I stepped onto the viewing platform to examine the Shroud I was overwhelmed with emotion because the image of (the man I believe is) Our Crucified Lord is powerful beyond words. It has the power to be an instrument of conversion, and I say that from personal experience. I went to Turin as a Protestant, but returned with the conviction that the Catholic Church is the one true Church founded and guided and sustained by Jesus Christ. At the time of Jesus, King Abgar V was the ruler of a powerful city-state called Edessa (modern-day Urfa, Turkey). According to an ancient legend, Abgar became gravely ill with leprosy. He had heard of the healing miracles of Jesus, and he sent a letter to Jesus inviting Him to come to Edessa, hoping for a healing. 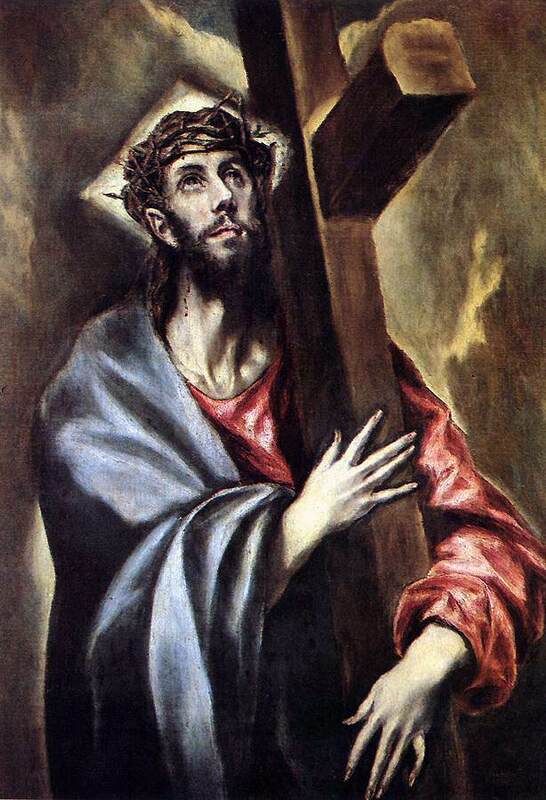 However, by the time the letter reached Jerusalem, Jesus had already been crucified. St. Jude Thaddeus reportedly took the Shroud to Edessa for the king to venerate. Not only was the king healed after seeing the image of Christ on the cloth, he was converted to the new Faith. Today, we often see statues and pictures of St. Jude holding a medallion of the Face of Jesus. It is believed that, at that time, the Shroud was folded and framed in such a way as to be able to see only the image of the Face on the cloth. The Shroud was then known as the Image of Edessa and later became known as the Mandylion. It remained in Edessa until the year 944 when it was taken to Constantinople (modern day Istanbul, Turkey). Constantinople was sacked by the Knights Templar in 1204, and the Shroud was one of the spoils of war. The Knights took it with them to France (after a brief detour through Athens, Greece). The Shroud came into the possession of the Italian royal family in 1453, and it was moved to its permanent home in Turin, Italy in 1578. In 1983, the Shroud came under the ownership of the Catholic Church, in accord with the will of Umberto II, the last of the Italian kings. Today, the Shroud resides locked away in a chapel of the Cathedral of St. John the Baptist in Turin, and is shown only rarely to the public. Exhibitions of the Shroud also occurred in 1998, 2000, and 2010. The next scheduled public exhibition will be in the year 2025. 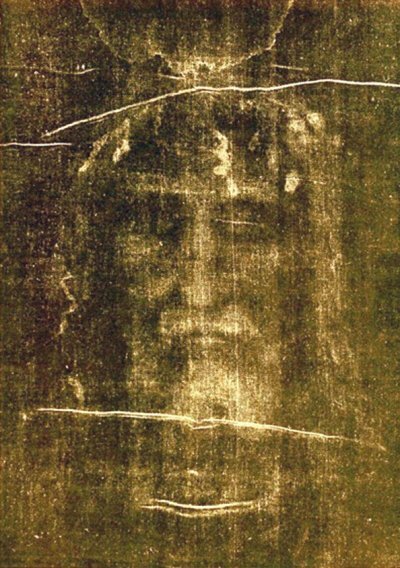 In one of historian Ian Wilson’s several books on the Shroud, he suggests that the story of the Veronica Veil (face of Christ imprinted on woman’s veil, after He wiped His face on it en route to Calvary) is actually a legend that originated with the facial image on the Shroud. Its viewers ostensibly came up with a compelling story as to how the image of the Holy Face came to appear on the cloth, not knowing that what they were looking at was actually a burial cloth. In their culture a burial cloth would have been considered “unclean”, thus it was folded to conceal its true identity. To support his theory, Wilson points out the Latin and Greek origins of the name “Veronica” being “vera” (Latin for “true”) and “icon” (Greek for “likeness”). Therefore, according to Wilson’s theory, Veronica may not have been an actual historical person, but rather a personification of the words “vera icon“, meaning “true likeness”. Fact or fiction? We may never know, but the Wilson theory is intriguing, nonetheless. Friends of The Pilgrim Center of Hope with small photos of the Shroud. Pete Remmert is second from the left. During the 2010 exhibition, my wife and I co-directed a pilgrimage to Turin in conjunction with the Pilgrim Center of Hope (a San Antonio-based Catholic ministry). One of our pilgrims was inspired with the idea that San Antonio would be an ideal location for a permanent exhibit dedicated to the understanding of the Shroud and what it teaches about Our Lord’s suffering. 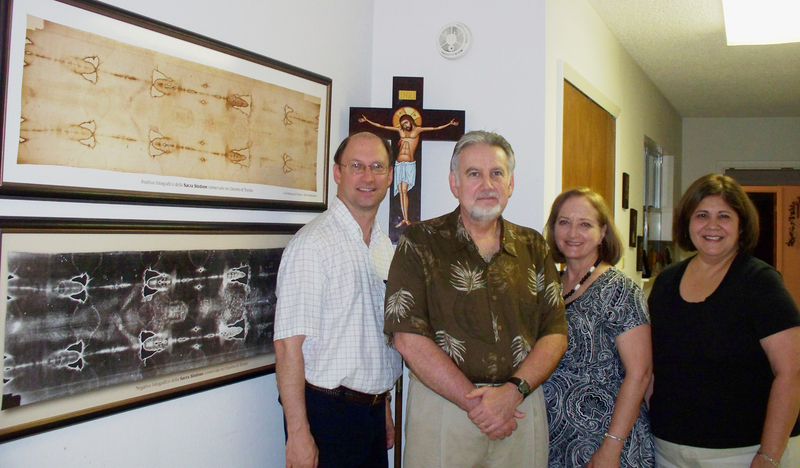 Plans are currently underway to bring the exhibit to San Antonio under the auspices of The Pilgrim Center of Hope. The exhibit – called “Who is the Man of the Shroud?” – will feature a life-size replica of the Shroud, a bronze statue of the man of the Shroud in repose, 3-D renderings of the images, and much more. I ask your prayers for this project so that many others will come to an understanding and appreciation for the Passion of Christ!